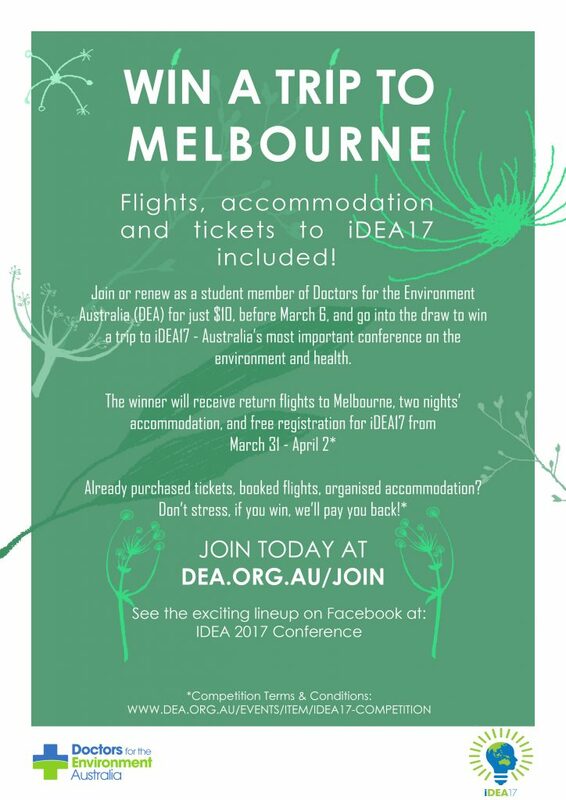 WIN A TRIP TO MELBOURNE FOR iDEA17!!! Flights, accommodation and registration to iDEA17 on 31st March – 2nd April 2017 included! 1) The promoter is Doctors for the Environment (DEA) whose registered office is at 67 Payneham Road, College Park, South Australia 5069. 2) The competition is open to Australian medical students aged 18 years or over, except employees of DEA and their close relatives, and anyone otherwise connected with the organisation or judging of the competition. 4) Current Student Members of DEA who renew will have 12 months added to their student membership. 5) By entering this competition, an entrant is indicating his/her agreement to be bound by these terms and conditions. 7) The competition will be promoted on Facebook, Instagram and Twitter. 8) Only one entry will be accepted per person. Multiple entries from the same person will be disqualified. 9) Opening date for entry will be 5th February 2017. Closing date for entry will be 5th March 2017 at 11:59pm. After this date no further entries to the competition will be permitted. 10) No responsibility can be accepted for entries not received for whatever reason. 11) The promoter reserves the right to cancel or amend the competition and these terms and conditions without notice in the event of a catastrophe, war, civil or military disturbance, act of God or any actual or anticipated breach of any applicable law or regulation or any other event outside of the promoter’s control. Any changes to the competition will be notified to entrants as soon as possible by the promoter. 12) The promoter is not responsible for inaccurate prize details supplied to any entrant by any third party connected with this competition. 13) There will be one major prizewinner. The main prize is as follows: free registration for one to iDEA17, one flight from the nearest capital city to Melbourne on 31st March 2017, one return flight from Melbourne to the same capital city on 2nd April 2017, two nights’ accommodation in Melbourne on the 31st March and 1st April 2017. 14) The carrier and the time for the flights on 31st March and 2nd April 2017 will be chosen by DEA, although consultation will be made with the major prizewinner to accommodate their needs as best as possible. 15) The place of accommodation for 31st March and 1st April 2017 will be chosen by DEA. 16) The prize is as stated and no cash or other alternatives will be offered. The prizes are not transferable. Prizes are subject to availability and we reserve the right to substitute any prize with another of equivalent value without giving notice. 17) Winners will be chosen at random by software, from all entries received, and verified by 12:00pm on 6th March 2017. 18) The winner will be notified by email and telephoned within 24 hours of the closing date. If the winner cannot be contacted or they do not claim the prize within 24 hours of notification, we reserve the right to withdraw the prize from the winner and pick a replacement winner. 19) If the major prizewinner has already purchased tickets to iDEA17, they will reimbursed for the cost of the registration. 20) If the major prizewinner has already purchased return flights to Melbourne from their nearest capital city for iDEA17, they will reimbursed for the cost of the return flights up to a maximum of $500. 21) If the major prizewinner has already purchased accommodation in Melbourne for iDEA17, they will reimbursed for the cost of the accommodation up to a maximum of $200. 22) The promoter will notify the winner when and where the prize can be collected. 23) The promoter’s decision in respect of all matters to do with the competition will be final and no correspondence will be entered into. 24) The competition and these terms and conditions will be governed by Australian law and any disputes will be subject to the exclusive jurisdiction of the courts of Australia. 25) The winner agrees to the use of his/her name and image in any publicity material, as well as their entry. Any personal data relating to the winner or any other entrants will be used solely in accordance with current Australian data protection legislation and will not be disclosed to a third party without the entrant’s prior consent. 26) This promotion is in no way sponsored, endorsed or administered by, or associated with, Facebook, Instagram, Twitter or any other social network. You are providing your information to DEA and not to any other party.